Using a pestle and mortar, grind the garlic to a paste with a little salt. Add the butter followed by the spices, olive oil and a little more salt, mixing until smooth. Prick the lamb all over with the tip of a sharp knife and place in a large mixing bowl. Rub the spice paste all over the lamb. Cover and refrigerate overnight. Preheat the oven to 200C/Gas 6 and take the lamb out of the fridge to come to room temperature. Place in a roasting tray and pour 100ml water around the sides. Cover with foil and put into the hot oven. Reduce the heat to 180C/Gas 4 and cook for 3 hours or until the meat is tender and can be pulled apart with a fork. Remove from the oven, cover and leave to rest for 20 minutes. Using two forks, shred the lamb. Transfer to a serving plate, season with salt and mix together. Scatter over the herbs and crumble over the feta. 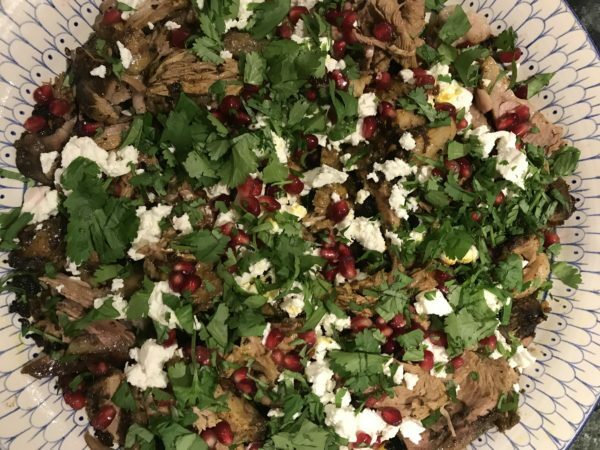 Finally, add the pomegranate seeds and serve immediately. 2, 3 and 4 oven AGA: Slide the roasting tin uncovered onto the lowest set of runners in the Roasting Oven and cook for 40-50 minutes then cover with foil and transfer to the centre of the Simmering Oven and leave to cook for 6-7 hours, basting every hour or so, when the lamb should easily come away from the bone.